On OS X, what files are excluded by rule from a Time Machine backup? In addition to whatever files I may choose to exclude, what files does the system exclude by rule or classification? It might make sense not to backup Trash or Caches, but I'm looking for a way to tell what files are skipped "behind the scenes." Knowing if the system maintains an exclusion list or exclusion pattern would be very helpful in managing larger groups of macs. There's a built-in list of exclusions stored in /System/Library/CoreServices/backupd.bundle/Contents/Resources/StdExclusions.plist. It's a bit too long to paste here comfortably, so I've posted a copy StdExclusions.plist (10.7.1) on Pastebin. There also is StdExclusions.plist (10.6.8 Server) on Pastebin. Some of the more obvious user file exclusions are Trash, Document revisions and MobileBackups from the local Time Machine store are all excluded. The rest of the exclusions are for system things like caches and databases that exist to index other files where the system can regenerate these databases after a restore. sudo mdfind "com_apple_backup_excludeItem = 'com.apple.backupd'"
tmutil isexcluded _item_ will determine if the volume, directory or file is currently excluded. tmutil addexclusion _item_ sets an exclusion rule so that the item (even if moved to a new location or renamed) will be excluded from future backups. tmutil addexclusion -p _item_ sets an exclusion rule so that the item path is excluded. This remains unchanged so if the file moves it will be backed up if not at this exact path and also will prevent backing up a file if it comes back in the same location as the rule specifies. tmutil removeexclusion _item_ removed either type of exclusion rule as appropriate. This applies to all versions of Mac OS X which have Time Machine. Source: Kevin M. White. Apple Training Series: Mac OS X Support Essentials v10.6. Peachpit Press. The root folders of snapshots also have a property list with folders that were excluded from the snapshot. My latest snapshot included the folders in StdExclusions.plist and the folders excluded in Time Machine's preferences. It didn't include files or folders that just had the com.apple.metadata:com_apple_backup_excludeItem extended attribute. Will return what is being ignored. Apps can tell TimeMachine to ignore certain files. Not the answer you're looking for? Browse other questions tagged macos lion time-machine . What does Time Machine back up? What folders can be safely excluded from Time Machine backup? Where does Time Machine store its settings? Time Machine is skipping files and folders. How to fix? Enable Time Machine to backup an SD Card? How can I find exactly what files are included in my last Time Machine backup? 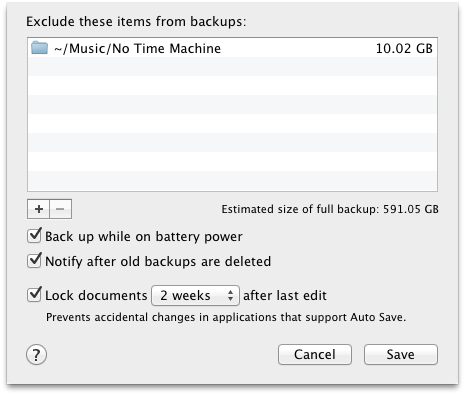 Why does Time Machine's backup size not equal the size of my hard drive? How do I backup an external HDD using TimeMachine? In Mountain Lion, where is the exclude list for Time Machine stored? How do I remove .sparsebundle files in my home folder from being excluded by Time Machine? What prevents Time Machine backup? Copy selected files from a Time Machine backup to iCloud?